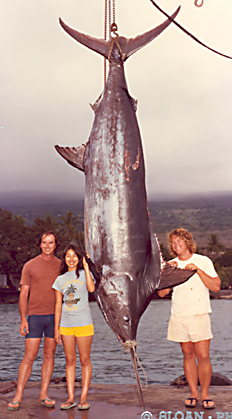 At the time of this catch, this marlin was 17 lbs larger than the existing world record but angler Rik Jones fought the fish from the rod holder and thus disqualified it from world record competition. It took Rik and Capt. Randy Holden of the 19-foot skiff, AILINA, an hour to bring this fish to gaff. It had struck a lure and was angled on 130-lb test line.